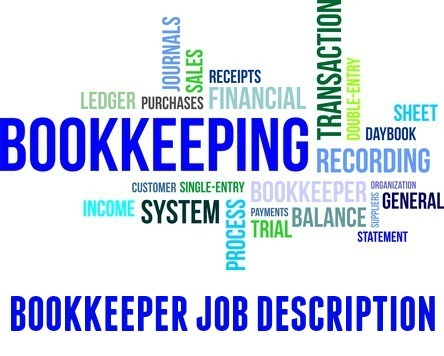 Bookkeeper Job Description - what does a bookkeeper do? The bookkeeper job description clearly outlines the primary responsibilities, duties and tasks of the bookkeeper job. Certain bookkeeper duties will vary according to the individual needs of the company but the core functions of the bookkeeper job remain unchanged. There is a high demand for good, accurate bookkeepers, they are key to the essential operations of a business or institution. Job opportunities in this field are ongoing. Adapt this bookkeeping job description for your own use. Responsible for maintaining the financial records of a company by accurately recording the day to day financial transactions of the company. Use these accountant job descriptions to get further job-related information. What are the top skills of a bookkeeper? Do you want to create an effective resume? You can use this bookkeeper job description to help you and the sample bookkeeper resume provides an excellent template for you. Send a persuasive bookkeeper cover letter with your job application. Need help with your bookkeeper job interview? Use the comprehensive guide to accounting interview questions and answers to prepare for success. Indeed.com reports that the average salary for US-based bookkeeper job postings on the site is $17.00 per hour as of March 2019.